Apache Struts 2 is a rich, large area framework for creating enterprise-ready Java web applications. This framework is elegantly designed to make efficient in full development cycle, from building, to deploying, and also in maintaining applications over the time. Apache Struts 2 was originally called as WebWork 2. This tutorial will help you how to use Apache Struts to create enterprise-ready Java web applications in simple and easy way. 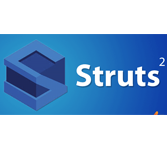 This tutorial is specifically designed for Java programmers to make the programmers to understand the Struts 2.x framework and its application. This tutorial will bring you at an intermediate level of experties. Before going through with this tutorial one should have thorough knowledge and good understanding of the Java programming language. A basic understanding of MVC Framework and JSP or Servlet is very helpful and useful.